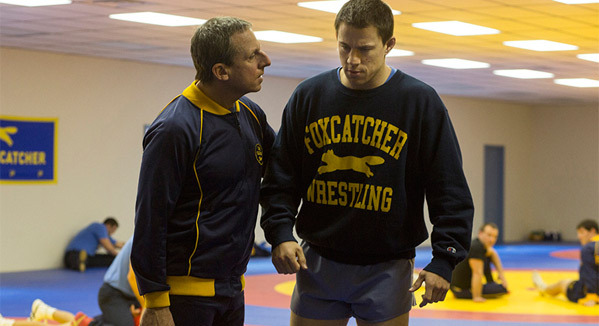 Pinning 'Foxcatcher' - Late Awards Spoiler or Prestige Pretender? Ask a dozen different Oscar prognosticators about Bennett Miller's latest drama Foxcatcher (starring Channing Tatum, Mark Ruffalo and Steve Carell as John du Pont) and you're likely to get a dozen different responses in terms of its awards chances. Some folks have it completely shut out, while others have it pegged as a sleeper film to beat in the major categories. Me? Well, I'm caught somewhere in the middle right now (without any trailers out yet), but truth be told I think it's at least got the potential to be a bigger player than some are expecting it to be. It certainly can fall short, but I believe it's a bit silly to bet against it totally. First of all, what is Foxcatcher about exactly? The film is a drama based on the real life relationship between Olympic wrestler Mark Schultz and millionaire John du Pont, who set up a training facility at his Foxcatcher Farm. The former was a wrestling champion training with his brother David and the latter was a paranoid schizophrenic who would up killing David, and this film tells that story. It's directed by Bennett Miller, who has seen both of his previous films Capote and Moneyball nominated for Best Picture (scoring a Best Director nomination for the first one too), and written by E. Max Frye & Dan Futterman (the latter being nominated for penning Capote). The rather impressive cast features Channing Tatum as Mark Schultz, Steve Carrell as John (seen in the first look here), and Mark Ruffalo as David Schultz, with prime supporting parts for Sienna Miller and Vanessa Redgrave, among others. Obviously this is an Oscar bait type of story. It's a true tale, with male bonding, murder, and mental illness, all of which the Academy loves. Assuming the final product is top notch, there are a number of places where this movie could make its mark. In the big categories, clearly there are Best Picture ambitions here. Miller will be a player for Best Director, while Carrell is at the moment being campaigned for Best Actor along with Tatum (obviously the former is a likelier contender than the latter), which has Ruffalo again competing for a Best Supporting Actor nod. You also have Frye and Futterman going for Best Adapted Screenplay and potentially some technical categories in play (keep an eye on Best Cinematography, where Grieg Fraser will look to avenge his snubs last year for Killing Them Softly and Zero Dark Thirty). Of course, this is assuming the film is any good. We obviously don't know if it's any good yet or not, but considering it's getting a major premiere at AFI Fest (on November 8th, to be exact) that's previously helped propel Best Picture contenders (though rarely with a World Premiere), I think there's a lot of confidence behind the scenes. Plus, so far Miller has only made Best Picture nominees, and while that kind of streak can't last forever, it's at least fair to assume there's a good shot of it continuing this year with his latest film. I actually have a suspicion that Foxcatcher could be the Secret Screening at the New York Film Festival, which is about to kick off here in the Big Apple. Previously that slot has gone to Martin Scorsese's Hugo and Steven Spielberg's Lincoln, so a lot of the speculation has The Wolf of Wall Street being the pick. We won't know for a few weeks still (and I actually have a plan to write a bit more about this anyway), but I think it'll be something else, with Foxcatcher a prime choice. Wherever the flick debuts, it's going to have to bank on some strong reviews to push it forward in the race. As one of the still unseen contenders, it's in an interesting position. On the one hand, something like Steve McQueen's 12 Years a Slave has set the bar pretty high, but on the other hand plenty of folks are still looking for that more ideal Oscar winner. I think Foxcatcher could at least compete to be the one. The best case scenario has the film being an absolute acting clinic that puts the entire cast in play for awards and solidifies Miller as one of the best filmmakers in the business. That could set it up as the primary competition for the powerful yet harder to sell 12 Years a Slave. The worst case scenario? Either the acting doesn't warrant attention or the film itself is some kind of odd step down for the director. The most likely scenario? Somewhere in between, which makes for a very interesting awards season. Time will ultimately tell here, but much like how Clint Eastwood's Million Dollar Baby waited until late in the game to spring itself on us and wound up not only getting a bunch of nominations but winning Best Picture too, I think Foxcatcher is following that same template. The film's release date isn't until December 20th, so it's going to be among the very final Oscar hopefuls to come out. I could very well be wrong, but I see the film itself, Miller, Carrell, Ruffalo, and the script being pushed heavily for awards attention. I'm hardly saying that Foxcatcher is going to end up winning Best Picture (among the unreleased/unseen contenders, I'm much higher on David O. Russell's American Hustle), but it's a bigger player than some are assuming, so I wanted to point that out and bring its potentially big candidacy to light for you all. There's going to be a very strong campaign put forward for it, so it pays to be prepared! We'll be watching closely for any updates and the trailer for Foxcatcher. Until then, what do you think about its awards potential? This film's premise sounds creepy as Hell. That's cause it's based on a story that is creepy as hell. John DuPont is crazy, and this story has always been a sad, unnerving one. Guess it doesn't matter for this one anymore, right? Sadly, no, at least until the next awards season. I wish this one was coming out this year!